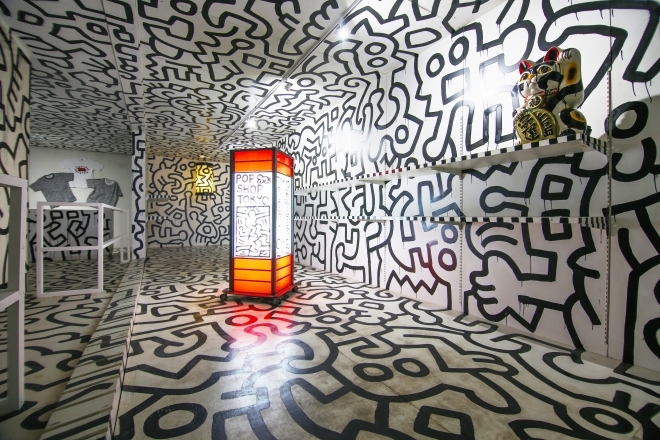 Keith Haring first received public attention and is probably best known for New York subway art. His bold lines, vivid colors, and active figures carry strong messages of life and unity,”The Radiant Baby” became his symbol. He created more than 50 public works between 1982 and 1989 in dozens of cities around the world. His “Crack is Wack” mural, created in 1986, is still visible from New York’s FDR Drive. He later went on to form a friendship with Andy Warhol who was the theme of several of his pieces, this friendship with Warhol would prove to be a decisive element in his eventual success. The collection on show in Salinas includes ‘Pop Shop Tokyo’ , ‘Channel Surf Club, Knokke’ , ‘Untitled (DV8)’ , the spectacularly colorful five panel mural that Harring created for DV8 Club in San Francisco and a seven-foot-tall sculpture ‘Untitled (Headstand)’. The exhibition at La Nave de Ses Salines hosted by collector and curator Lio Malca runs from the 1st of July until the 30th of September, Tuesday to Sunday from 11am to 1pm and then from 5pm to 10pm. Admission (in the spirit of Harrings quote below) is free.